Da Capo Lifelong Books, 9780738284613, 256pp. The benefits of Prime-Time Parenting include better nutrition, better school performance, a more organized home, and well-rested parents and children. The hours between 6 and 8pm will never be the same! Heather Miller is the Director of LePage-Miller, Inc, an education firm based in New York City. A graduate of MIT, the Harvard Graduate School of Education and NYU's Tisch School of the Arts, Miller has developed and delivered educational programs for over twenty years. 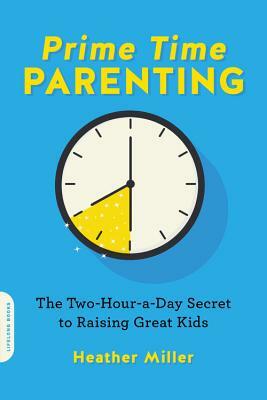 "Prime Time Parenting belongs on the bookshelf of every parent who means well and tries hard, but is often so tired and stressed that the precious time we have with our families at the end of the day can unravel in chaos. Heather Miller has written a no-nonsense and supremely helpful guide designed to not only to bring sanity and structure to family evenings, but to create the space to connect with the very people who give our lives so much joy and meaning."